Tripoli, Libya (CNN) -- Airstrikes Sunday in the heart of Moammar Gadhafi's Tripoli compound had a military objective but also no doubt brought a message of allied resolve to the Libyan leader's doorstep. A coalition military official confirmed to CNN that the compound was targeted because it contains capabilities to exercise command and control over Libyan forces. The coalition's goal is to degrade Gadhafi's military capabilities. The official, who was not identified because of the sensitivity of the information, insisted that neither Gadhafi nor his residence was the intended target. The leader's whereabouts were not known. Earlier, Western journalists, including CNN's Nic Robertson, were brought inside by Libyan officials to survey the destruction. A four-story building was heavily damaged, possibly by cruise missiles, Robertson reported. Robertson said early Monday that two circular holes in the building may be telltale signs of such missiles, although that could not be immediately confirmed. The building is only 100 yards or so from a statue of a golden fist crushing a model plane emblazoned with "USA" -- a monument to the 1986 U.S. bombing of Libya, in which one U.S. plane was downed. Special guests who visit Gadhafi at a nearby large tent are usually housed in the building, reported Robertson, who held a chunk of metal with a label indicating military usage. Video footage showed collapsed columns, pieces of weaponry and chunks of concrete. There were no reported casualties. U.S. officials said they are not targeting the leader, who has defied international calls to stop attacking opposition forces. "We are not going after Gadhafi," U.S. Vice Adm. Bill Gortney said at a Pentagon press briefing. "Regime forces are more pressed and less free to maneuver." Asked about reports of smoke rising from the area of Gadhafi's palace, Gortney said, "We are not targeting his residence." The United States, detailing significant damage to Gadhafi's air defenses and a military convoy, also fought a public relations campaign Sunday, insisting that two days of coalition bombing weren't going beyond mandates in the United Nations Security Council resolution. Secretary of Defense Robert Gates warned against widening the current allied operations to include a direct attack on Gadhafi, who earlier Sunday labeled the coalition "terrorists." Anything that goes beyond enforcement of the no-fly zone and prevention of new military attacks on rebels risks disrupting the "very diverse coalition" that agreed to the attacks, said Gates, adding there was unanimous agreement in the top echelons of the Obama administration to push forward with military action in Libya. U.S. officials said they plan to hand over operational control of the military mission in coming days. The coalition has nine other announced partners: Belgium, Britain, Canada, Denmark, France, Italy, Norway, Qatar and Spain. Gates said the operation is off to "a strong and successful start." He made the comments while traveling to Russia, which said earlier Sunday that innocent civilians were being killed and urged more caution. The Foreign Ministry in Moscow cited reports that "nonmilitary" targets were being bombed, including a cardiac center. The Libyan government has claimed that 48 people, including women, children and clerics, have died in allied attacks. "We have no indication of any civilian casualties," Gortney said. A member of the Libyan opposition told CNN that the Gadhafi government collected bodies of people killed in fighting in the past week and displayed them over the weekend, trying to show they were killed by coalition airstrikes. The claim by Ahmed Gebreel, who cited eyewitnesses and medical officials, could not be verified by CNN. The Libyan military on Sunday called an immediate cease-fire after allied forces pounded one of its convoys near Benghazi and, according to U.S. officials, significantly degraded the regime's air defenses. National Security Adviser Tom Donilon scoffed at the report of the cease-fire, saying, "It isn't true, or it was immediately violated." Meanwhile, President Barack Obama and his national security team worked behind the scenes to shore up support within the Arab world for the military mission in Libya, according to senior administration officials. The senior officials described the Obama team's phone calls as making clear to the Arab League that bombing Gadhafi's air defenses falls within the Security Council resolution's scope of imposing a no-fly zone and taking "all necessary measures" to stop the dictator from attacking civilians in his own country. "We don't believe this goes beyond the resolution," said one senior administration official. The lobbying came after Arab League officials complained earlier Sunday that the bombing by the U.S. military and other allies inside Libya exceeded the scope of merely instituting a no-fly zone. Arab League Secretary-General Amre Moussa told reporters before an emergency meeting Sunday that what is happening in Libya is different from what was intended by imposing a no-fly zone, according to Egypt's state-run Ahram newspaper. "What we want is the protection of civilians and not the shelling of more civilians," Moussa said, adding that "military operations may not be needed in order to protect the civilians." But Arab League chief of staff Hisham Youssef said Moussa's comments did not signify a shift by the organization. "The Arab League position has not changed. We fully support the implementation of a no-fly zone," Youssef said. "Our ultimate aim is to end the bloodshed and achieve the aspirations of the Libyan people." On TV news shows in the United States, politicians debated the military campaign's possible endgame. "This is a very limited operation that is geared to save lives, and it was specifically targeted on a humanitarian basis," Senator John Kerry, D-Massachusetts, told NBC's "Meet the Press." Senator Lindsey Graham, R-South Carolina, and a member of the Senate Armed Services Committee, said on "Fox News Sunday" that this is the "best chance to get rid of Gadhafi in my life." "If we don't get rid of him, we will pay a heavy price down the road," Graham said. U.S. Joint Chiefs of Staff Chairman Adm. Mike Mullen told CNN that Gadhafi forces have shown little ability to counter coalition firepower. Allied aircraft struck a Misrata area airport that has both civilian and military uses, Gortney said. Three B-2 bombers struck only military positions at the airfield, he said. There was violence across the country Sunday, with Gadhafi apparently shelling rebels in the west, while allied airstrikes destroyed one of Gadhafi's convoys in the east. As of Sunday night local time, the United States and British military had fired a total of 124 Tomahawk missiles at Libya's air defense sites, Gortney said. Gadhafi had said the strikes were a confrontation between the Libyan people and "the new Nazis" and promised "a long-drawn war." "You have proven to the world that you are not civilized, that you are terrorists -- animals attacking a safe nation that did nothing against you," Gadhafi had said in an earlier televised speech. 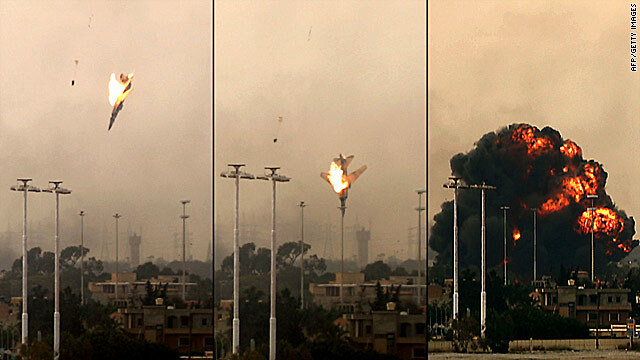 At the same time Gadhafi spoke, his regime was shelling Misrata using tanks, artillery and cannons, a witness said. "They are destroying the city," said the witness, who is not being identified for safety reasons. He said rebels were fighting back. Sounds of heavy gunfire could be heard during a telephone conversation with the man. CNN's Arwa Damon saw outside Benghazi the remains of a convoy of at least 70 military vehicles destroyed by multiple airstrikes Sunday, leaving at least five charred bodies, plus twisted tanks and smashed trucks as far as she could see. Rebels with Damon told her it was a convoy of Libyan troops loyal to Gadhafi coming to attack Benghazi. Residents of the city, which was reported to be calm late Sunday, believe they can now take the offensive against loyalist troops.